Welcome Facebook Civil War buffs! If you enjoy this article, please “Like” it at the bottom of the page and help me spread the word about this Siege of Petersburg site. Also, if you like what you see here, check out our PetersburgSiege twitter page, our Facebook Siege of Petersburg Page, and subscribe to this site via email. From March 24-28, 1865, 150 years ago this week, Ulysses S. Grant was finalizing plans to end the Civil War with concerted moves on all fronts. Grant wanted to move as soon as the Spring sun dried up the Virginia roads, and his overriding fear was that Robert E. Lee would escape from the siege lines around Richmond and Petersburg before that movement could take place. If Lee did escape cleanly, he might get away into the mountains to the west, or worse yet, join General Joe Johnston’s force opposing Sherman in North Carolina. Grant believed the war might go on another full year, and he desperately wanted to prevent that possibility at all costs. The Army of the Potomac and Army of the James had been ordered quite some time ago to be ready to move at a moment’s notice, and Grant kept that a standing order indefinitely. Before that date however, there were some preliminary moves which needed to take place. Phil Sheridan’s two cavalry divisions would need to cross the James River on March 26, 1865, collect their wayward sister division which had been left with the Army of the Potomac since early August 1864, and settle in on the U. S. Military Railroad near Hancock’s Station. Edward O. C. Ord would remove two White infantry divisions from the Twenty-Fourth Corps, one Black division from the Twenty-Fifth Corps, and his lone cavalry division from the lines facing Richmond. He was to move with these forces on the night of March 27, 1865, taking two days to traverse the 38 mile distance to his destination. That destination was the current left of the Army of the Potomac. The Vaughan Road crossing of Hatcher’s Run. The Monk’s Neck Bridge over Rowanty Creek, just south of where Hatcher’s Run and Gravelly Run combine to form the larger stream. Humphreys’ Second Corps would take the more northern approach on the Vaughan Road. The Second Corps had captured this crossing point during the February 5-7, 1865 Battle of Hatcher’s Run (or Dabney’s Mill) within Grant’s Eighth Offensive against Petersburg. Meanwhile Warren’s Fifth Corps would again cross Rowanty Creek at the exact same spot as they had on February 5, 1865 during the Eighth Offensive. This time, however, Warren would not necessarily be a point of safety for a cavalry raid. That’s because Grant was sending out a much larger cavalry force to participate this time around. Rather than send one cavalry division, Grant would instead send Phil Sheridan to command the three cavalry divisions which had made up the Army of the Potomac’s Cavalry Corps up until early August 1864. Now, however, there was a slight name change. The former First and Third cavalry divisions of the Army of the Potomac had accompanied Sheridan to the Shenandoah Valley. They had been merged into his Army of the Shenandoah, and were still labeled as such now. Wesley Merritt was the commander of this “Cavalry Corps, Army of the Shenandoah.” George Crook would be brought in by Grant on March 27 to take over Gregg’s Second Cavalry Division, Army of the Potomac for this final push. David McM. Gregg had resigned shortly after the Hatcher’s Run battle in February 1865, and his cousin and then Henry Davies had taken over in the interim. Grant apparently felt Crook, a man who had worked with Sheridan closely during the Shenandoah Valley Campaign, would better fit the bill. Now that we’ve taken a look at the mobile force, let’s turn our attention to the troops left behind. The Ninth Corps held the far right of the Army of the Potomac, their right anchored on the Appomattox River east of Petersburg and their left past the Jerusalem Plank road southeast of the Cockade City. The Sixth Corps took up the line from here, holding much of the ground gained during the Fourth through Sixth Offensives. Ord would be massed behind the Union lines held by Humphreys’ Second Corps. The Ninth Corps’ role was set in stone. No matter what, they would be attempting to hold Confederate troops in the trenches nearer Petersburg, preventing them from moving to reinforce the Confederate right in response to Grant’s movement. Worst case, if all other troops were ordered out to reinforce Grant’s flanking column, the Ninth Corps would hold approximately the same lines held by the Union Army after the Fourth Offensive in late August 1864. Grant was prepared to abandon a lot of hard earned territory, gambling that the troops who left could be used to finally break the stalemate at Petersburg, and by extension, Richmond. “The Ninth Army corps will be left intact to hold the present line of works so long as the whole line now occupied by us is held. If, however, the troops to the left of the Ninth Corps are withdrawn then the left of the corps may be thrown back so as to occupy the position held by the army prior to the capture of the Weldon road. All troops to the left of the Ninth Corps will be held in readiness to move at the shortest notice by such route as may be designated when the order is given. “All necessary preparations for carrying these directions into operation may be commenced at once. The reserves of the Ninth Corps should be massed as much as possible. While I would not now order an unconditional attack on the enemy’s line by them, they should be ready, and should make the attack if the enemy weaken his line in their front, without waiting for orders. In case they carry the line, then the whole of the Ninth Corps could follow up, so as to join or co-operate with the balance of the army. To prepare for this the Ninth Corps will have rations issued to them, same as the balance of the army. General Weitzel will keep vigilant watch upon his front, and if found at all practicable to break thought at any point, he will do so. A success north of the James should be followed up with great promptness. An attack will not be feasible unless it is found that the enemy has detached largely. In that case it may be regarded as evident that the enemy are relying upon their local reserves, principally, for the defense of Richmond. Preparations may be made for abandoning all the line north of the James, except inclosed works—only to be abandoned, however, after a break is made in the lines of the enemy. This is how Grant’s orders stood at the end of the day on March 24, 1865. But Lee was about to try to throw in a monkey wrench. Would it succeed? The short answer, as regular readers and others familiar with the Siege of Petersburg realize, is “no.” Lee’s last ditch assault on March 25, 1865 at Fort Stedman turned into a disaster. Losing thousands of literally irreplaceable men was bad enough, but the Second and Sixth Corps both gained a lot of ground on the skirmish lines west and southwest of Petersburg. These positions would be more favorable to utilize as a potential jumping off point for head on surprise rushes against the Confederate trenches. The events of March 25 didn’t delay Grant’s timetable one bit. March 29 would continue to be the starting date for the grand spring offensive. “General Sherman having got his troops all quietly in camp about Goldsborough, and his preparations for furnishing supplies to them perfected, visited me at City Point on the 27th of March and stated that he would be ready to move, as he had previously written me, by the 10th of April, fully equipped and rationed for twenty days, if it should become necessary to bring his command to bear against Lee’s army, in co-operation with our forces in front of Richmond and Petersburg. General Sherman proposed in this movement to threaten Raleigh, and then, by turning suddenly to the right, reach the Roanoke at Gaston or thereabouts, whence he could move on to the Richmond and Danville Railroad, striking it in the vicinity of Burkeville, or join the armies operating against Richmond, as might be deemed best. This plan he was directed to carry into execution, if he received no further directions in the meantime. I explained to him the movement I had ordered to commence on the 29th of March; that if it should not prove as entirely successful as I hoped I would cut the cavalry loose to destroy the Danville and South Side railroads, and thus deprive the enemy of further supplies, and also prevent the rapid concentration of Lee’s and Johnston’s armies. So Ord would now wait to see how the flanking move developed, using a portion of his force to man the picket lines vacated by Humphreys. This would give the illusion to the Confederates that these lines were still fully manned all the way to Hatcher’s Run. In reality, however, Ord’s men would be massed very near Hatcher’s Run, with the ability to be ready to quickly help Humphreys and Warren if needed. “First. At 3 a. m. of the 29th instant the Fifth Army Corps, Major-General Warren commanding, will move to the crossing of Hatcher’s Run at W. Perkins’ house; thence west to the junction of the old stage road and the Vaughan road, and from this point will open communications with the Second Corps on the Vaughan road. This accomplished, the Fifth Corps will be moved to occupy a position in the vicinity of Dinwiddie Court-House. Second. At 6 a. m. of the same day the Second Corps, Major-General Humphreys commanding, leaving their pickets to be relieved by troops from Major-General Ord’s command, will move down the Vaughan road, cross Hatcher’s Run and Gravelly Run, and open communication with Major-General Warren’s corps. This done, the Second Corps will be posted at the intersection of the old stage road and Quaker or military road. Third. The Sixth Army Corps will be held in readiness to abandon the line of works now held by it, under orders from these headquarters, when its line of march will be indicated. The commanding officer of the Sixth Army Corps will occupy the line of works to Fort Cummings, putting the surplus artillery in the rear line of works. Fourth. The commanding officer of the Ninth Army Corps will hold his present line until notified of the abandonment of the Sixth Corps line by that corps, when he will take up the return from Fort Davis to his left. Fifth. The Second, Fifth, Sixth, and Ninth Corps will be supplied as directed in circular of March 14, 1865, from these headquarters. Sixth. The trains of the Second and Fifth Corps not directed to go with the troops, and the general headquarters train, will be parked under the direction of the chief quartermaster of the Army of the Potomac, in the neighborhood of W. Perkins’ house, on Hatcher’s Ran, and will be guarded by the Provisional Brigade and Colonel Spaulding’s command, Engineer Brigade. Seventh. The trains of the Sixth and Ninth Corps will be held in readiness to move, under the direction of the chief quartermaster of the Army of the Potomac. Eighth. The chief engineer Army of the Potomac will detail a pontoon train of about 100 feet of bridge, to accompany the Fifth Corps to Hatcher’s Run. The remainder of the train will await orders in their present camps, and will be prepared to move within lines of the Ninth Corps, and eventually to City Point, unless other orders be sent to them. Ninth. The commanding officer cavalry division will at once prepare his command to move under the special instructions sent to him. Tenth. Each corps will be prepared to move with five four-gun batteries (three smooth-bore and two rifled), instead of with nine four-gun batteries, ordered in paragraph 6 of circular of March 14. But one battery wagon will be taken with Second and Fifth Corps, the remainder will be parked with general train at W. Perkins’ house. The artillery will in all other respects be made to correspond to instructions of that paragraph. Eleventh. With each corps will be taken the intrenching tools, one-half the ambulances, one medical wagon, one army wagon with hospital supplies to each brigade, and one army wagon with forage to each division ambulance train. The remainder of the ambulance train of the Second and Fifth Corps will be parked with the general train at W. Perkins’. Twelfth. Ammunition wagons sufficient to carry twenty rounds of ammunition per man will accompany each division. Thirteenth. Major-General Parke will assume command of the line of works from Fort Cummings to the Appomattox, including the defenses of City Point and the troops now garrisoning that post and line of works. He will keep up a threatening attitude with the force at his disposal, and in case he should discover any weakness on the part of the enemy he will attack at once, and with his whole force if necessary. With the cavalry now at his disposal and to be assigned to him he will watch and picket the roads in rear of his line. Fourteenth. The commanding officer of the cavalry division will, before leaving, detail a mounted regiment to report to Major-General Parke. Let’s take some time to dissect these orders as issued. Nothing much had really changed from Grant’s original March 24 orders. Meade had simply taken those more vague instructions and tailored them to suit his army. He gave more specific destinations to his flanking columns under Warren and Humphreys. Note that in this original version of the orders, Warren was to move in the direction of Dinwiddie Court House, as it will come into play multiple times in the coming week. Humphreys would cross Hatcher’s Run and move up the western bank in a northwesterly direction, making sure to try to stay in contact with Warren. Warren would again cross Rowanty Creek at Monks’ Neck Bridge, near the Perkins house, as he had during the Eighth Offensive. Staying south of Gravelly Run, he would move down the Monks’ Neck (or “Old Stage”) Road, then on to the Vaughan Road, following it to its intersection with the north-south Quaker (or “Military”) Road. The Sixth Corps and Ninth Corps would hold in their trenches for now. Grant’s repeated desire to travel light is reflected in Meade’s orders. Note the instructions to move with far less artillery than normal. The flanking corps would each bring along only five batteries, three containing smoothbores and two using rifles. In addition, the batteries had been reorganized that spring to contain only four, rather than the previous six, gun tubes. This meant artillery support for the Second Corps and Fifth Corps would be 12 smoothbores and 8 rifled pieces each. Lastly, the orders for a pontoon train capable of building a bridge 100 feet long to accompany Fifth Corps would come in handy. The pontoon train was supposed to be used mainly to get across Rowanty Creek, but it would be needed urgently on the afternoon of March 29 when orders were changed. But more on that later. Three divisions of the Army of the James, two of the Twenty-fourth, and one of the Twenty-fifth Corps will march to-night, General Turner’s division leading. His wagons will cross in advance at Deep Bottom this p. m. and at Broadway as soon after dark as practicable. He will camp near the railroad from City Point to the left of the Army of the Potomac. General Birney’s division will start at dark this p. m., trains in advance, crossing at Aiken’s, and in crossing at Broadway its trains will follow General Turner’s division and in advance of its troops (Birney’s), and when crossed will encamp in rear of General Turner’s division. The cavalry under command of General Mackenzie will to-morrow night [March 28, 1865] cross at the Aiken bridge, crossing as early as possible after dark, and follow the infantry as rapidly as may be. The whole command is expected to reach the ground occupied by the Second Corps Wednesday morning [March 29, 1865]. Arrangements will be made by division commanders to collect and punish stragglers at each bridge and not to let them pass the bridges scattered. The engineer troops will form the rear of the other infantry and camp with headquarters of the army. All the troops will move with four days’ rations in haversacks and eight days’ in wagons. To avoid hauling as much as possible, commissaries and quartermasters will have sufficient supplies delivered by rail at the railroads at a point which will be designated to till up the wagons. Sixty rounds of ammunition per man will be taken in wagons, and as much grain as the transportation on hand will carry after taking the specified amount of supplies. In regard to other details, commanders will be governed by the verbal instructions received from these headquarters. While not as long as Meade’s orders (Ord had a much smaller force to command in the coming operations), they were just as detailed. The goal was to start early enough to enable this mobile force from the Army of the James (3 infantry divisions and 1 cavalry division) to replace Humphreys’ Second Corps skirmishers by the morning of March 29, 1865, the day the offensive began. “The Fifth Army Corps will move by the Vaughan road at 3 a. m. to-morrow morning [March 29, 1865]. The Second moves at about 9 a. m., having but about three miles to march to reach the point designated for it to take on the right of the Fifth Corps, after the latter reaching Dinwiddie Court-House. Move your cavalry at as early an hour as you can, and without being confined to any particular road or roads. You may go out by the nearest roads in the rear of the Fifth Corps, pass by its left and passing near to or through Dinwiddie, reach the right and rear of the enemy as soon as you can. It is not the intention to attack the enemy in his entrenched position, but to force him out if possible. Should he come out and attack us, or get himself where he can be attacked, move in with your entire force in your own way, and with the full reliance that the army will engage or follow, as circumstances will dictate. I shall be on the field and will probably be able to communicate with you. Should I not do so, and you find that the enemy keeps within his main entrenched line, you may cut loose and push for the Danville road. If you find it practicable, I would like you to cross the South Side road between Petersburg and Burkeville, and destroy it to some extent. I would not advise much detention, however, until you reach the Danville road, which I would like you to strike as near to the Appomattox as possible. Make your destruction on that road as complete as possible. You can then pass on to the South Side road, west of Burkeville, and destroy that in like manner. Sheridan had quite a bit of leeway in what he could do, reacting to circumstances as he saw fit. If the Confederates came out of their entrenchments, he was to go at them. If they remained behind cover, he was authorized change his role into a large scale cavalry raid on the Danville and South Side railroads. One key point not stated in then orders above was that Sheridan was not to go off on his railroad raid until/unless Grant told him so. Grant wrote in his report of the campaign that he had “previously informed [Sheridan] verbally not to cut loose for the raid contemplated in his orders until he received notice from me to do so.” Whether Sheridan would ever receive the “cut loose” orders remained to be seen. Major-General Humphreys will not move before 9 a. m., unless previously notified that the troops of the Army of the James are in position. On moving, Major-General Humphreys will take up a position, his right resting on or near Hatcher’s Run and his left extending to the Quaker road. He will advance his skirmishers, well supported, and feel for the enemy. If found in force outside his works, he will attack and endeavor to force him into his works. Meade was worried that if Humphreys’ Second Corps moved out too early on the morning of March 29, 1865 (i.e. 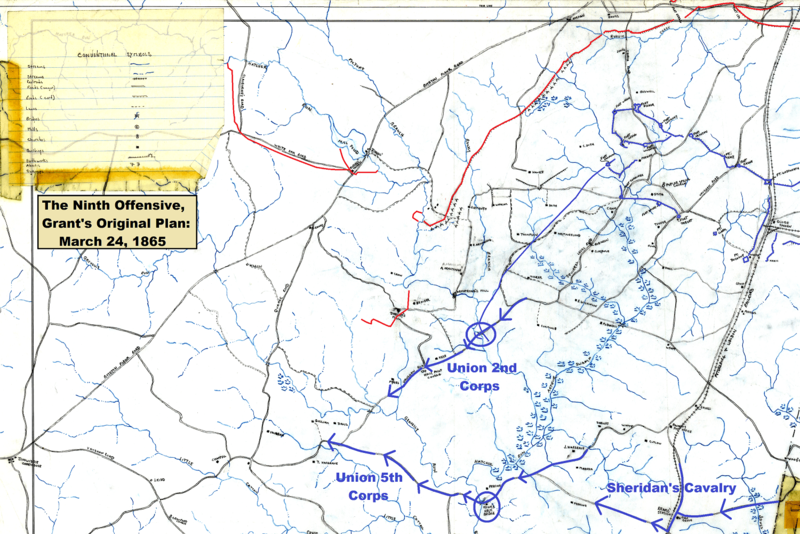 before Ord’s men from the Army of the James reached their destination from over 30 miles away), the Confederates might get between the flanking column (Second and Fifth Corps plus Sheridan’s Cavalry) and the men left behind to man the trenches in front of Petersburg (Sixth and Ninth Corps). By tweaking the March 27 orders to cause Humphreys to move out later, or at least after Ord arrived, he’d keep one continuous line with no easily discernable weakness from the Appomattox River to Gravelly Run, too long a distance for the Confederates to properly guard without fatally compromising at least portions of their line. Meade’s second tweak was another manifestation of his customary cautiousness. Warren was to stay closer to where Humphreys would be rather than pushing all the way to Dinwiddie Court House. Moreover, he was not to make his assigned move up the Boydton Plank Road until Humphreys had crossed Hatcher’s Run and Warren had been notified of this fact. The goal, of course, was to prevent the Confederates from massing between any of his moving parts, hitting a vulnerable flank. Meade wasn’t concerned with the connection between Warren and Sheridan’s cavalry at this point. Sheridan was moving up to Dinwiddie Court House well beyond Warren’s flank, and as Warren moved northeast up the Boydton Plank Road, he would need to watch out for his left, the left of the entire moving infantry force. There would be no protection in that regard from Sheridan.